After testing the Sapphire NITRO+ AMD Radeon RX 470 8GB and seeing what it it capable of delivering for mining Ethereum and some other crypto currencies it is time to also test a smaller 4 GB version of the Radeon RX 480. We have managed to get our hands on an MSI Gaming X AMD Radeon RX 470 4GB video card and we tested it, so below you can read about our experience and findings using that particular model. The good thing about the MSI RX 470 card is that it runs on 6.6 GHz (1650 MHz) video memory by default and has an OC mode that overclocks the video memory to 7 GHz (1750 MHz), so we could easily test both modes. 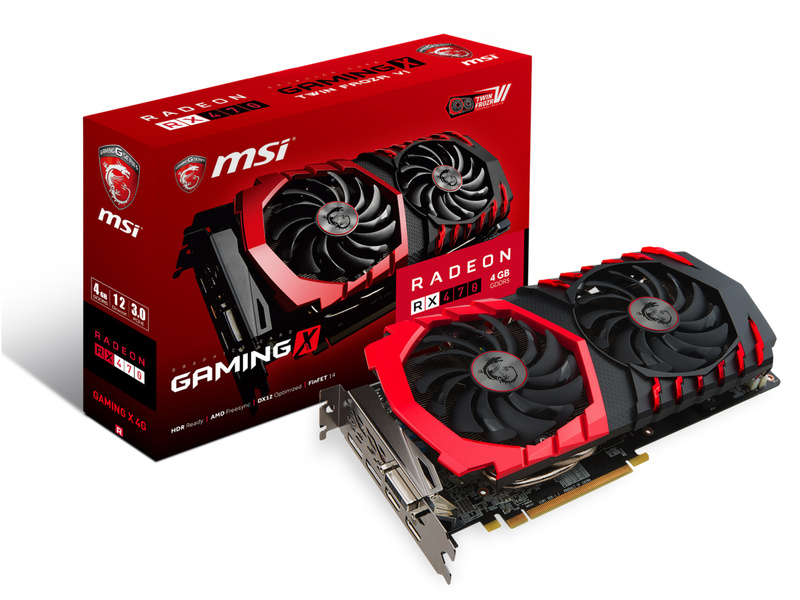 As you’ve probably read already the Radeon RX 470 8 GB we tested from Sapphire is with 8 GHz video memory, so as you’d expect the MSI card should be slower for Ethereum mining, let us see how much exactly. Using the Claymore Dual Miner for mining Ethereum (ETH) at the default settings with the video memory at 6.6 GHz (1650 MHz) the hashrate we are getting is about 20.5 MHS. That is roughly 4 MHS slower than what the RX 470 8GB from Sapphire manages to do with its memory running at 8 GHz. So significant difference in the performance you get at default settings between a 4 GB and 8 GB versions of the RX 470 for mining Ethereum. A larger difference is also to be expected in other mining algorithms that are more memory intensive than GPU intensive. For algorithms that are not so memory dependent on the video memory there should not be much of a difference in performance between he 4GB and 8GB models of the Radeon RX 470. Moving to 7 GHz for the video memory (1750 MHz) on the MSI Radeon RX 470 4GB we get an increase of the Ethereum mining hashrate to about 22.1 MHS. That is about 1.6 MHS increase over the result we got from the 6.6 GHz (1650 MHz) video memory and is slower by 2.4 MHS compared to the RX 470 8GB with memory running at 8 GHz. We wanted to try overclocking the video memory further over the 7 GHz frequency and see if that will bring some extra performance and we could achieve up to about 7.5 GHz stable for mining Ethereum. The problem however was that instead of the hashrate further increasing as we overclock the video memory past the 7 GHz mark the result was the opposite, we started seeing a drop of the hashrate below 20 MHS. It seems that after 7 GHz the timings of the video memory are being changed to less aggressive values and even though we get higher frequency it does not manage to result in better performance for mining Ethereum at least. The maximum limit for how high we could set the video memory operating frequency we got available was 8.4 GHz (2100 MHz), but of course we could not get even close to it with this slower video memory like we could easily reach it with the RX 470 8GB Sapphire card that starts at 8 GHz. So what about other mining algorithms? Well, the results we got were a bit disappointing and not because of the hashrates, but because of the way that the video card behaved that got us puzzled. Using the latest AMD Crimson Edition 16.8.1 Hotfix driver and trying to run some sgminer tests for other popular algorithms pretty much resulted in us getting blue screens, so we’ve moved to the version that MSI provides for that video card on their website. Using the 16.7.3 release made things a bit better, no blue screens anymore, now the system just restarted instead. When testing the Sapphire RX 470 8GB model we had no such trouble, however back then we’ve used an earlier beta driver that Sapphire put on disk included with the video card and it behaved much better than what we’ve seen with these two newer releases. So we’ve had to try the Sapphire NITRO+ AMD Radeon RX 470 8GB with the AMD Crimson Edition 16.8.1 Hotfix driver and guess what, the same blue screens started appearing when trying to run sgminer via the NiceHash Miner package for the same tests that were working with the beta driver prior to that on the same GPU. So it seems that the problem is related to the video drivers and the most recent versions apparently are not good for mining anything other than Ethereum or at least almost anything, because Ethereum mining seems to be working just fine with all of the drivers. If you are interested we can upload and share the Sapphire beta drivers that seem to be working better if you are experiencing similar problems with RX 470 trying to mine anything other than Ethereum. We’ve managed to get our hands on an AMD Radeon RX 470 video card and not just any, but the best out there – the 8GB Sapphire NITRO+ AMD Radeon RX 470, so we’ve had to put it to a test to see how good it will perform for mining Ethereum (ETH) and other popular crypto currencies using different mining algorithms. The Sapphire NITRO+ 8GB model of RX 470 is probably the best you can get in terms of mining performance among other RX 470 offerings because it comes with memory clocked at 2000 MHz (8 GHz) or with other words the same memory frequency as the reference design RX 480 GPUs. This faster video memory makes it interesting especially for mining Ethereum, but there are other good points to that video card as well such as the 8-pin PCI-E power connector, the good cooling solution and the 1260 MHz boost clock of the GPU. The only drawback is that the price of the Sapphire NITRO+ AMD Radeon RX 470 8 GB should pretty much be the same as the price of 8 GB reference design RX 480s. The 4 GB models of RX 470 are apparently equipped with slower memory, so as far as Ethereum mining goes they will perform slower than the 8 GB NITRO+ version, though i other algorithms they may not be much slower. The hashrate that the Sapphire NITRO+ AMD Radeon RX 470 8GB manages to provide out of the box for mining Ethereum is about 24.5 MHS or almost much what the reference design Radeon RX 480 manages to deliver mining ETH. Again this is because of the 8 GHz video memory used on that model from Sapphire, other RX 470 cards with 4 GB come with 7 GHz or 6.6 GHz video memory and that will for sure result in a slower hashrate for Ethereum. The Sapphire NITRO+ manages to keep just fine the GPU boosted to the maximum 1260 MHz is supports all the time, though for Ethereum mining you can lower that frequency by reducing the power limit below 100% on the Power Target as ETH does not benefit much from the higher GPU frequency and you can reduce the power usage without a hit in performance. 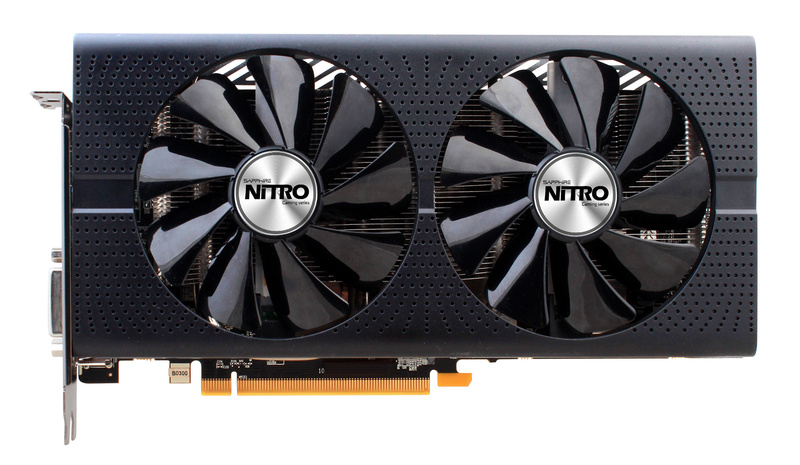 Overclocking the Sapphire NITRO+ AMD Radeon RX 470 8GB has left us a bit disappointed. We kind of expected to be able to push the 8 GHz video memory to at least 8.8 or 9 GHz like you can on most reference design RX 480. Unfortunately we ended up with up to 8.2 GHz (2050 MHz) maximum limit from AMD’s WattMan and maximum 8.4 GHz with the use of the ASUS GPU Tweak II tool. We are still somewhat short on options for overclocking tools for the new AMD RX series of GPUs, so this forced overclocking limit has left us disappointed. We are not sure if it was forced because the GDDR5 memory chips from Samsung are not capable of working at higher frequencies without problem or as a safety measure so that the RX 470 turns out slower than RX 480 even when overclocked. The result of the limited video memory clock is important only for Ethereum mining as the result is slower maximum hashrate. At the maximum of 8.4 GHz (2100 MHz) for the video memory we were able to get just about 25.8 MHS mining Ethereum or with other words just about 1.3 MHS more than the stock clocks hashrate. We are yet to see how the 4 GB models of the RX 470 will perform with Ethereum due to their lower default video memory clocks as well as how much it will be possible to overclock them. 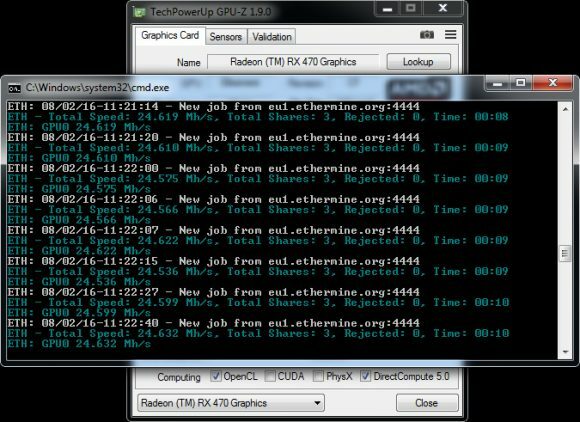 When the AMD Radeon RX 480 was released there was an issue with the drivers that prevented users from successfully mining many of the crypto currencies that used sgminer as the miner just crashed with an error. Since the RX 480 was actually a new architecture there was no way to just get back to older video drivers and have no trouble running sgminer, however it seems that the situation has improved significantly since then, though it is still not perfect for some algorithms and miners. Since at that time most people were using RX 480 for Ethereum mining where no problems with the miners were present that was not much of an issue, but due to various reasons a lot of people have since moved to other alternative coins. Above you can see the hashrates for many of the more popular algorithms supported by Nicehash and tested with their dedicated mining solution that bundles multiple miner programs in a single package. 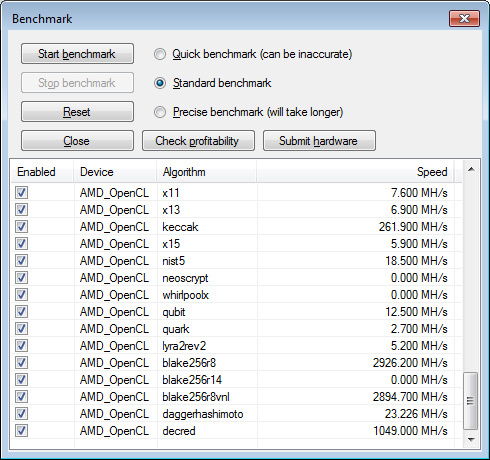 You can see some benchmarks of the AMD Radeon RX 480 using the NiceHash miner here and note that quite a few of the algorithms back then reported 0 MHS hashrate. At the moment it seems that only Neoscrypt, WhirlpoolX and Blake256r14 are still problematic and are reporting 0 MHS hashrate. That is of course only for the listed algorithms supported by NiceHash and there are quite a few others as well. It is important to note that the Sapphire Nitro+ RX 470 8GB is getting pretty close in terms of performance to a stock RX 480 with 8 GB and in some cases the results are even slightly better (due to further optimizations) and in the others the performance is not behind by much. Still the presence of a little more Stream Processors in the RX 480 gives it an advantage in the more GPU intensive algorithms compared to the RX 470. Unfortunately the GPU frequency of the RX 470 cannot be pushed much higher like on the RX 480, so hoping to compensate the difference with higher OC will just not do. Just to add information about some more algorithms, the LBRY sgminer crashes the video driver, so we could not get a result in terms of hashrate. As for the SiaCoin sgminer, it has managed to provide us with 906 MHS hashrate mining on the Siamining pool using Stratum, so there were no problems with that miner. Hopefully the issues with some miners and some algorithms not working with the new AMD RX series of GPUs will be resolved as AMD is probably already preparing the faster RX 490 for a release alter this year and it is highly likely it being an interesting solution for crypto miners as well. The new AMD Radeon RX 470 GPUs are supposed to start hitting the market in a few days and since their bigger brother – the RX 480 has turned out to be a good choice for Ethereum mining, although it did not perform that good in other algorithms, people are interested in how well the RX 470 does. We got a tip from a reader that apparently has an RX 470 8GB video card in his hands already and along with the information that was sent there was also a screenshot included to show the Ethereum mining performance he is getting. The hashrate at stock settings for the GPU shows 24.5-24.6 MHS mining with Claymore’s Dual Miner (only for ETH) and this is pretty much what the Radeon RX 480 does with the default settings. So it seems that the slightly lower number of Stream Processors in the RX 470 did not result is drop of hashrate at least for mining Ethereum (ETH) as it is a more memory intensive algorithm, do note however that it should affect performance in other more GPU-intensive algorithms. Unfortunately we don’t yet have any information regarding the performance of the RX 470 in other algorithms, but we should in a couple of days when we manage to get our hands on the new AMD video cards. 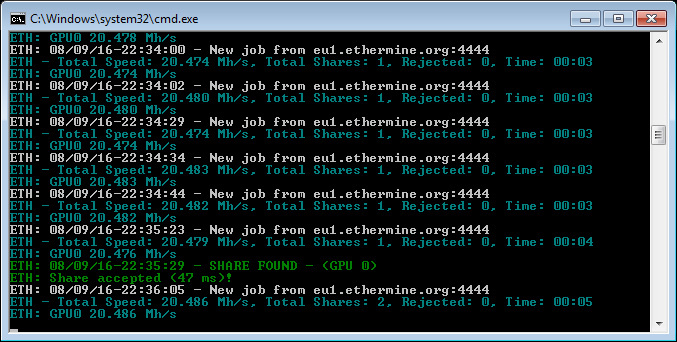 Do note however that there is a catch in this result being the same as on Radeon RX 480, the reason for the same Ethereum mining hashrate hides in the video memory. 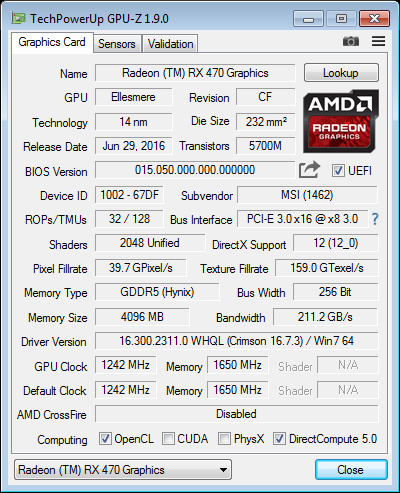 As we mentioned the results shown on the screenshot are from an 8 GB model of RX 480 that apparently has the video memory running at 8 GHz (the same as on RX 480 8GB models), so the same performance is to be expected. There will however be AMD Radeon RX 470 GPUs with 4GB of video memory where the operating frequency could vary between 6.6 GHz and 7 GHz and these should have lower performance for Ethereum. The expected hashrate in mining Ethereum is more like around 20 MHS for the 6.6 GHz video memory and about 21 MHS for the 7 GHz models. So should you buy RX 470 8GB models with 8 GHz memory instead of RX 480 8GB models with 8 GHZ video memory if you are interested in mining Ethereum, Ethereum Classic or another crypto currency that uses ethash-based algorithm? Don’t be in a hurry to do so, because while most RX 480 cards with 8 GHz video memory could easily hit 8.8 GHz or 9 GHz with overclock it is highly likely that the RX 470 cards could be more limited in their overclock capabilities. Another thing to note is the price difference between the RX 470 and RX 480 for the 8GB models with 8 GHz video memory, if it is not big enough the 480 could remain the better choice.